On Thursday, March 1, 2018, in New York’s Soho hood, the artsy fartsy folks, socialites, pretty young things and business titans came out in droves to meet German’s answer to Andy Warhol, pop artist, Michel Friess. Mother Nature cooperated perfectly as the 6-9pm vernissage did not experience a drop of rain on the outside cobblestone streets til 9:01pm. Guests came, commented on the art, posed with middle fingers in the air like Audrey in a signature painting while others wanted to grab the pop art dollar bill off the wall. Keeping everyone in fine spirits was Forever Young wines flowing endlessly throughout the night. A live trio of talented jazz musicians filled the air with ambient background music during the event. The “German Pop Art Meets New York” exhibition by German pop artist, Michel Friess will stay up at Studio Anise contemporary furniture store at 21 Greene Street in Soho ​through May. 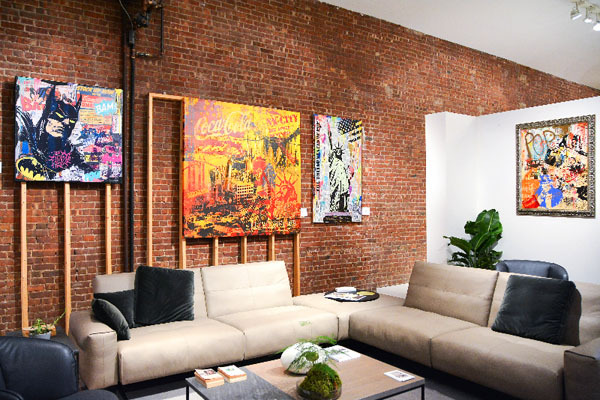 The artwork hung on exposed brick walls stand out with bright neon accents while complementing the modern furniture pieces by Rolf Benz, Germany’s top upscale lifestyle brand.. Pop art prices range from about $1000 to $10,000 depending on size and medium (canvas or aluminum) with most in the $4-5,000 range. Custom pop portraits can also be ordered. Over forty years after the famed Andy Warhol was born in America, a German boy came to life with similar aspirations. Pop artist, Michel Friess was born in 1970 in Neustadt a.d. Weinstrasse, Germany. In his youth, Friess was attracted to street art and after experiencing the bohemian sides of New York and Vegas, he was hit with the pop art spell. He became known for his portrait work of renowned personalities published by his “German Pop Art” label. 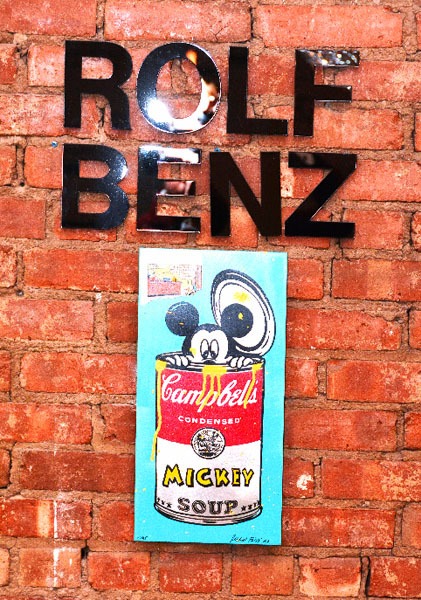 Reminiscent of Warhol, pieces of Friess artwork pay tribute to items like the Campbell’s soup can and characters like Mickey Mouse, Superman and Batman. Past legends appearing in Friess’ works include Marilyn Monroe, Audrey Hepburn, John Lennon, Johnny Cash and Steve McQueen. More recent celebrities and notables include Arnold Schwarzenegger, Billy Idol, Angela Merkel, Giorgio Armani and former Mr. Universe, Ralf Moller. And this month Friess even did a pop portrait of the current U.S. President that was personally delivered to Donald Trump at Mar a Lago. Over time, Friess has been honored with many art awards and has had exhibitions throughout Europe. 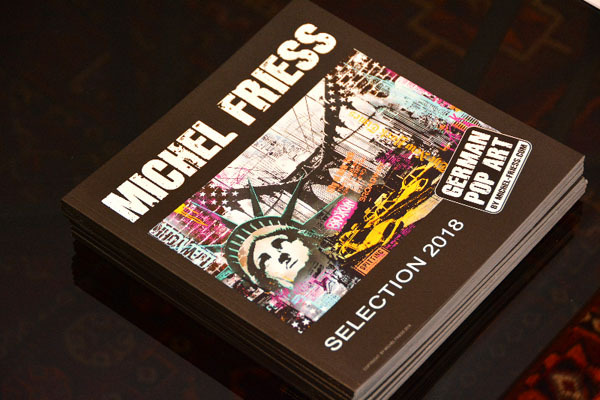 Friess is represented by more than 30 galleries throughout Germany plus galleries in Austria and Spain. In April 2013, the top European art magazine, “Der Kunsthandel” placed Friess artwork titled “Berliner Dom” on its cover. And most recently in January 2018, Friess had the grand opening of a Pop Art Gallery store in Shanghai, China dedicated exclusively to his work. Friess’s technique to create his artwork is pure handicraft. He is famous for his works on aluminum, but also uses canvas and wood for his pieces. His artwork is created by applying hand-silkscreen printing with every sieve custom-made from wood and strung by Friess himself. The process is very intricate with up to 20 different sieves being used for one work of art. Friess applies a mixture of hand-silkscreen printing, painting, airbrushing from spray cans and paper collages to his art. His work has become his signature. New Yorkers and visitors can come see Michel Friess’ pop art in SoHo at STUDIOANISE which houses the ROLF BENZ U.S. Flagship furniture store, presenting a carefully curated exquisite collection of contemporary home furnishings. 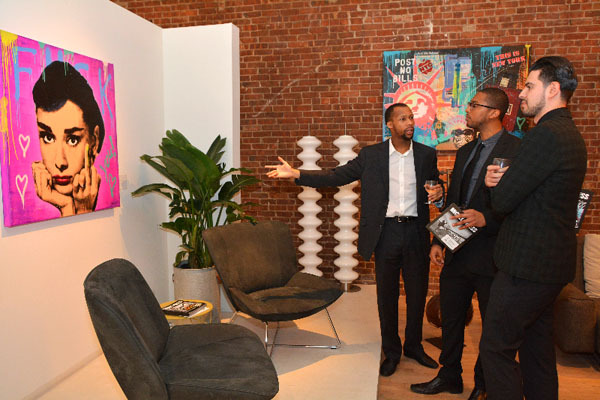 The exhibition titled “German Pop Art Meets New York” hosted an invitation only vernissage on March 1. The exhibition will continue through May in SoHo concluding after the ICFF contemporary furniture fair. The Michel Friess art exhibition at the Anise/Rolf Benz U.S. flagship store is a synergistic affair of German art and design. Michel Friess flew in from Germany along with his art publisher/gallery, Popart-Gallery owners to celebrate this union in SoHo. 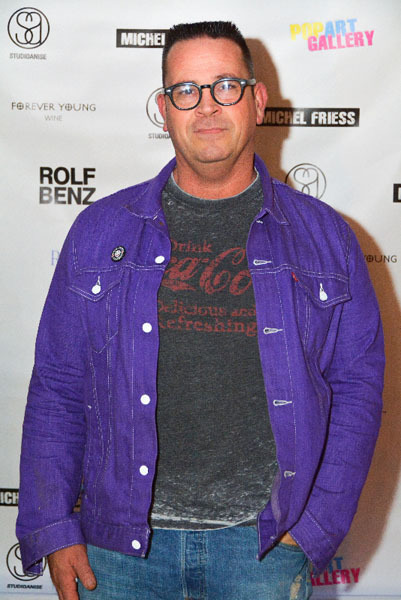 StudioAnise/Rolf Benz U.S. flagship store owner, Paul Anis is delighted to share his special SoHo space with the talented German pop artist, Michel Friess. Artwork on exhibition can be purchased and custom portraits can be commissioned by the artist, Michel Friess. German publisher and gallery representing Michel Friess.